I spent most of my life fantasizing about the way my life was supposed to be. I achieved a lot of what I set out to accomplish. I attended an Ivy League School, became an attorney, got married, built the big house, traveled extensively, had great friends and family, and to top it off had three beautiful daughters. On paper my life looked like “I had it all.” Yet, I felt trapped! These feelings were the impetus for me to search for inner peace… and search I did! I read books, said affirmations, attended workshops, posted mantras on my bathroom mirror, did rebirthing ceremonies in warm pools, sweat in sweat lodges, had my aura cleansed by Indian Shamans, and went to more psychics and astrologers than I care to mention. I was looking for someone to give me my answers. And while I had “aha” moments and periods of joy and self-love, they never lasted. Finally, I realized that nobody had my answers, a magical solution, or the ability to fix me. I needed to do the work myself and I needed to work from the inside out. I came to realize that nothing in my external world — the weight, the marriage, that feeling that I was stuck on a gerbil wheel — was going to change until I shifted the way I felt about myself. This was what brought me to The Ford Institute in 2002. Founded by the New York Times best-selling author Debbie Ford, The Ford Institute offers personal development courses and professional coaching training programs and has helped tens of thousands of people worldwide transform their lives in fulfilling and enriching ways. As a student, I immersed myself in the work and witnessed my own life completely transform. I let go of my marriage and worked through a difficult divorce and all of the emotions and changes that accompanied it. I lost the weight I used as my protective shield, transformed my physique, and shifted my relationship with food and my body. I created a new home, a new career, and went from financial fear to freedom by stepping into new levels of responsibility in every area of my life. I have amazing relationships and learned to open my heart and receive and give love in ways I never dreamed possible. I have reached new levels of self-awareness and acceptance, and feelings of joy, purpose, and fulfillment that I never thought possible. I have realized my purpose and feel free to be self-expressed, authentic, and fiercely confident in my passion to serve, empower, and liberate others. Most importantly, I became the woman I aspired to be and have grown as a mother and role model for my three daughters! It was my own healing and evolution that led me to become a Master Integrative Life Coach. I wanted to help others cross the bridge and share with them the amazing gift of liberation that I had been given. Shortly after getting certified, I was selected to be a teacher, core faculty member, and eventually leader of The Ford Institute. 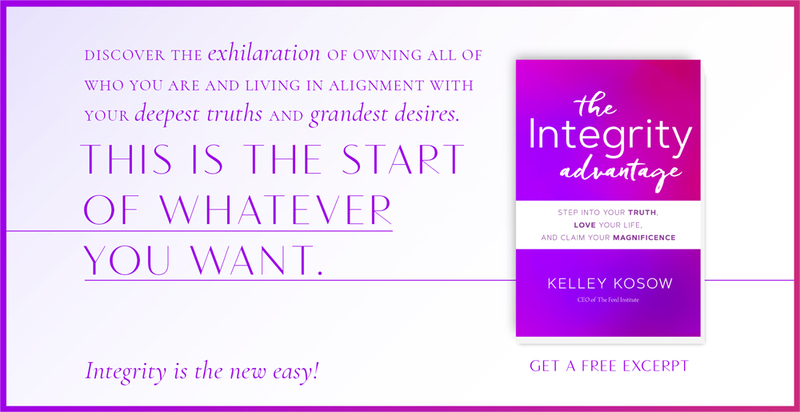 This journey is what inspired me to write my book, The Integrity Advantage: Step into Your Truth, Love Your Life, and Claim Your Magnificence, a step-by-step guide that helps you shed all of the ways you have been out of integrity, empowers you to own that you are whole and complete, and guides you to live in alignment with your deepest truths and grandest desires. Today, I am humbled to be an author, speaker, coach, and the CEO of The Ford Institute, supporting the evolution of thought leaders, influencers, and dynamic, motivated individuals around the globe. “Before I attended The Shadow Process with The Ford Institute, I was sad that I would not be able to experience the teaching from Debbie Ford directly. I wondered how anyone other than her could possibly teach only what she could teach and share. After reading three of Debbie’s books and doing all of the exercises. After watching the movie and videos Debbie generated. After completing The Shadow Process Workshop in LA with Kelley facilitating, I am complete and fully confident that Debbie is smiling from wherever she is, in the knowing that Kelley is not only continuing the work Debbie began, but is putting a spin on the process that only Kelley can do. Submit your questions about life, love, career, and more, and I'll answer them over The Fierce Life. By clicking "SUBMIT" you are agreeing that we have the right to use your question and first name on The Fierce Life blog. Kelley may not respond to your message, or answer your question directly. If you are in need of medical or psychological help, call a professional immediately.